❤Enjoy your happy holiday from now on! Travel around the world and keep your devices charged with this universal all-in-one travel adapter and converter. Compatible with US, UK, AU and EU, this portable converter is an all-in-one prong setup that doesn’t take up space. This is the truly all-in-one travel adapter, which is suitable for more than 200 countries around the world. 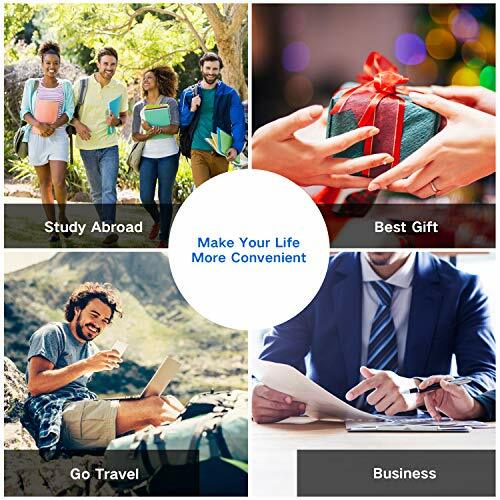 With TryAce, easy to travel around the world. 1.Exclusive Technology: Charge faster with innovative tech, compatible with almost all electronic equipment. 2.Converter mode to convert the foreign electricity from 220-240V to 110-120V for single US voltage Electric Products. 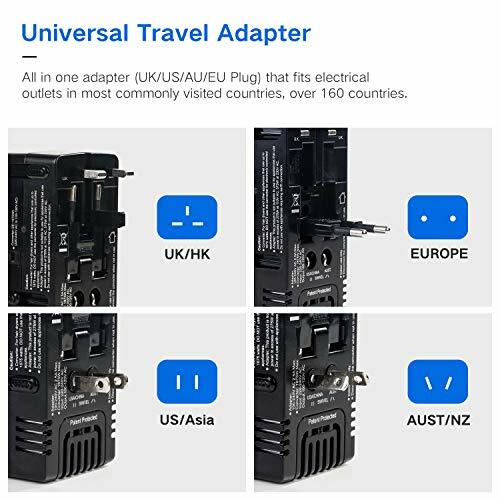 3.Easy to use, all in one adapter and converter combo (UK/US/AU/EU Plug) that fits electrical outlets in most commonly visited countries, over 200 countries. 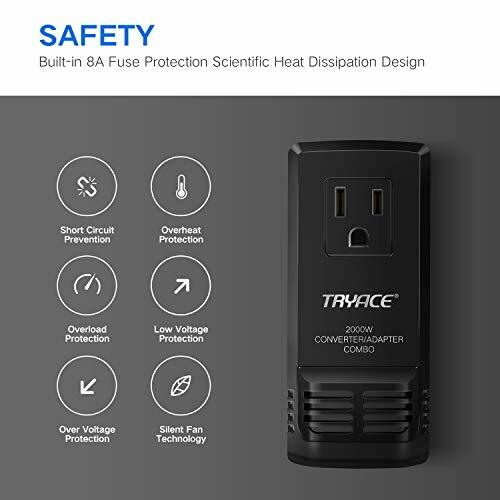 ❤Converter Mode–Travel transformer can convert foreign electricity from 220-240V to 110-120V specially designed for US appliances, MAX 2000 Watts. Electric products are simple heating devices or have mechanical motors. Examples are hair dryers, steam irons, electric kettle etc. It CAN NOT be used with the low-wattage appliances (0-25W). ❤ Adapter Mode— Use Adapter Mode for DUAL VOLTAGE (110-220V, 120-240V) devices, such as iPhone charger, iPad charger, Laptop, MAC, Dual Voltage Hair straightener and other Dual Voltage Appliances. Dual voltage appliances must be used adapter mode. 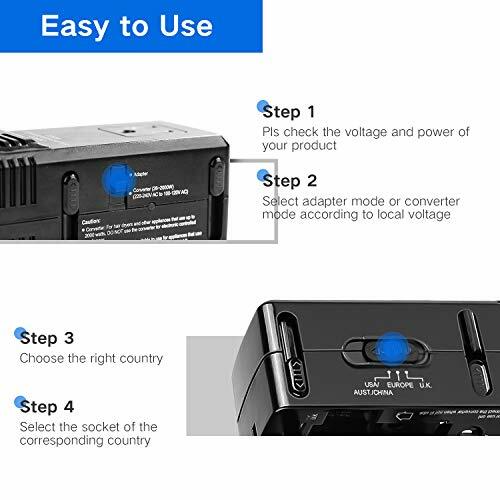 Pls check the product you intend to use has the proper voltage and wattage rating to run your devices.This product is a step-down converter, cannot use converter mode in 110V countries and regions. 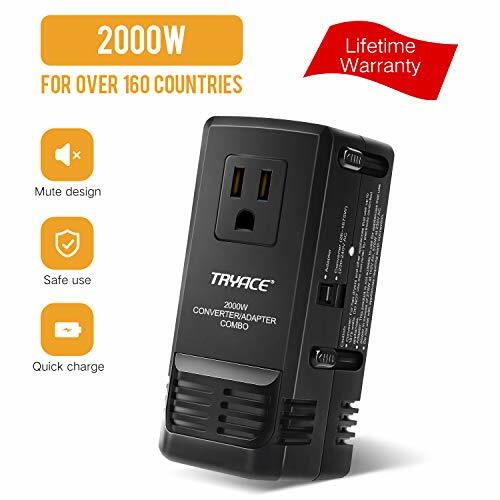 ✅ 【WORLDWIDE USE】4 International adapters plug (US/UK/AU/EU ), step down voltage converts 220/240V to 110/120V, so you could use American electronics in 220V/ 240V countries .With tryace travel adaptor, you can connect to nearly every region of the world! 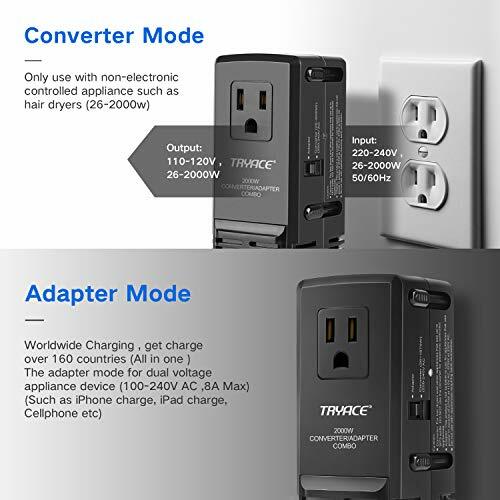 ✅ 【COMPATIBLE WITH ALL EQUIPMENT】TryAce worldwide universal adapter can be used for most dual voltage appliances. Such as laptop, CPAP machine, electric toothbrush, fan, nebulizer, game console, Kindle, TV, DVD players, lights, iPad, and other electronic devices. 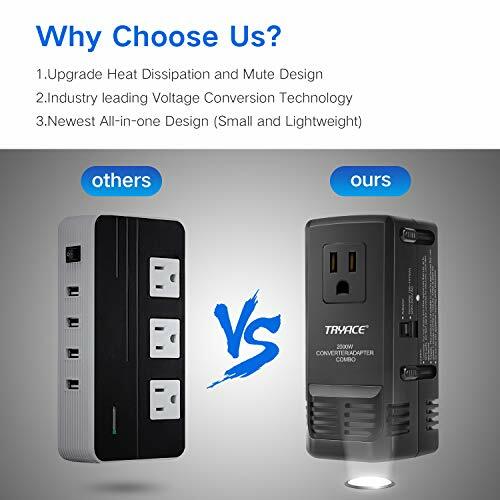 ✅ 【LIFETIME GUARANTEE】We are professional TryAce travel adapter factory , all products have CE, FCC, RoHS,ETL and other authoritative certificate. We are confident in the quality of our product and willing to provide 100% lifetime guarantee.